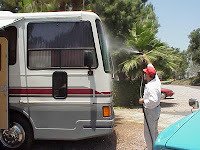 Vicki, it would be fine to consider a truck wash center to clean the motorhome as long as you skip the "pre-rinse." According to reports I've read, the US and several other countries are working to halt the use of HF or ABF (Acid) "pre-rinse" products. So if you are asked about a “pre-rinse,” decline it. Which is better, hand or line wash? Though a line wash is done by someone else, (and saves you the elbow grease), I personally favor hand washing. It puts you face-to-face with the finish of the coach and allows you to actually see the things that require your attention before they become a major issue. Frankly, it is your coach and the reality is you will do a far better job than any line wash employee. This is especially true if you invest in some good quality brushes. There are many available but typically the softer the brush, the easier it will be on the finish of the rig. You asked about buffing or waxing and what products to use and/or avoid. I think it’s better I share my philosophy with you concerning exterior RV care maintenance procedures. Start with a monthly sweep of the roof to help minimize dust, pollution and chalk buildup. This will also help to eliminate those dreaded black streaks. Use a soft-bristle broom and a dustpan to remove the accumulation from the roof. If the roof is fiberglass or painted aluminum consider waxing it. If the roof is rubber or vinyl, treat it only with products designed to leave a dry finish. Waxing or treating will minimize the amount of dust and dirt that sticks making future sweeping and regular care easier. Wash and wax the coach regularly; I recommend once every three to four months for the best, longer-lasting results. Make the task easier by working only one side each month, then the front and rear in succeeding months. Using this schedule will reduce your time at the task making the overall process more manageable. Product selection can be critical so I suggest sticking with brand names from within the RV marketplace. Become very familiar with your vehicle and its many surfaces prior to making your selections. Know the make-up of every exterior surface on your rig. Most products will list acceptable surface applications so always read the label carefully. Be sure to read and understand the directions (so many of us do not). If you have a question about any product, call the supplier directly. Have them convince you why you should be using their product. Company contact information is usually found on the product label. Most suppliers will have toll free help lines and many have web-sites that can be helpful. Look for a UPC bar code on the label. Bar codes are an indication of the manufacturer’s commitment to the retail marketplace. Avoid homebrews and so-called backyard chemistry products; they rarely work and may even cause surface damage. Avoid any product that does not list a phone number, address and UPC code on the container. The good ones are proud of their product and will always welcome feedback and communication. Once a product is selected be sure to choose a small inconspicuous area on the coach to test it first. Evaluate it for a few weeks or longer if necessary. This will keep missteps manageable and you’ll find the best product match. If the result of testing is acceptable, complete the coach and maintain it regularly. Lastly, consider a total coach cover for those brief periods of non-use. Avoiding UV and ozone damage is very beneficial.